Windscreen Panel Height Color qty. PolyMesh 80% Wind Screen blocks 80% wind and light. Finished height for all panels will be 4" less to allow for wind flow. Example" 6' x 50' will be 5'8" x 50' finished size. 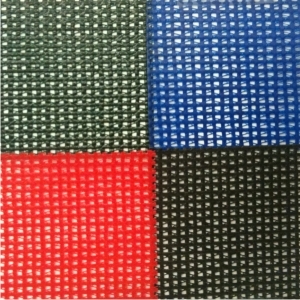 When color windscreen matters PolyMesh fabricated panels feature: 7 color options, standard 50' lengths as well as custom panels. All panels are finished with extra strong 4-ply hem borders including grommets spaced at 24" intervals on all four sides and UV protected double vinyl color coating to seal in strenth and durability (3 year guarantee not to crack, peel or discolor).. transform common chain link fence into colorful, attractive boundaries to match your school or community colors. CUSTOM PANELS (other than 50' long) i.e., Gates, doors, 12" x 12" finished windows or to fit-finish your project... 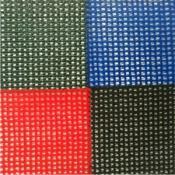 Call for Assistance and Quote- 12" Wind flaps - (only available on PolyMeshwindscreen)- please call to add to your panel. Note: All panels have a 3-5 day lead time. Please keep this in mind when placing your order.